For some it’s just water. For us, an endless sea of possibilities. 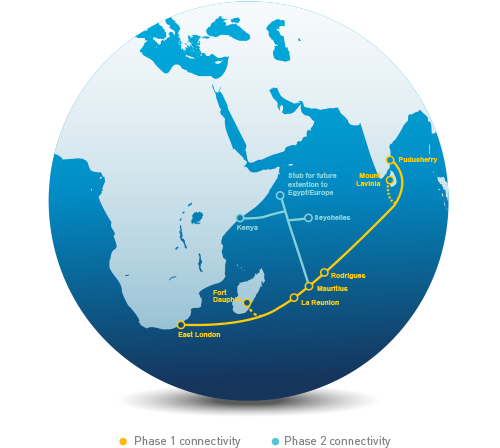 The IOX Cable System is the first submarine system to connect Mauritius to Rodrigues, with onward connectivity to South Africa and India to the rest of the world. Our commitment is to help transform Mauritius into an international data hosting center and key exchange point for the ICT and financial sectors in the Indian Ocean. We take pride in our endeavor to connect India, Africa, South East Asia and Europe to Indian Ocean islands and provide high speed network access to enhance business in these segments. The design capacity of the IOX Cable System is 13.5 Tb/s per fiber pair. The multiple terabits-per-second of capacity will provide a paradigm shift and transformation to industries in terms of improving business efficiencies, enabling revenue acceleration and speeding-up new market exploration. 25 years, ensuring scalable capacity transformation at a faster lead-time, while retaining industry benchmark service quality. This will ensure revenue assurance and customer experience by catering to dynamic and changing requirements of customers. Our network will provide a gateway to Africa as well as to the rest of the world by leveraging our industry connections and partnerships with multiple cable systems, ensuring access to a variety of content hosted in these geographies. This will create opportunities for customers to establish valuable linkages across geographies and industries. IOX will be the first submarine cable system connecting Rodrigues to Mauritius and rest of the world. Thus, impacting the island landscape in terms of education, employment and socio-economic development. The IOX Cable will extend to India (Puducherry) and South Africa (East London), offering two exits out of Mauritius. The partner of the deployment has been finalized and contract is in force.